Hi everyone! So if I'm bringing the blog out of hibernation... it's gotta be some good material, right?! Well, that IS the case. Plus, I've got 4th of July company here who I don't want to wake by shooting a video right now, so I'm opting for blogging. Let's hope I can keep this up with some regularity- because I miss writing! 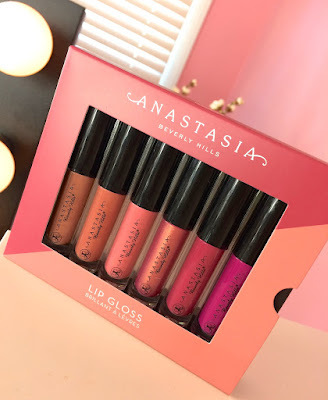 Anyway... my point: I tried this new Anastasia Summer Mini lip gloss set (ordered it from the ABH website along with the Modern Renaissance palette and a couple of other things)... and it REALLY impressed me. 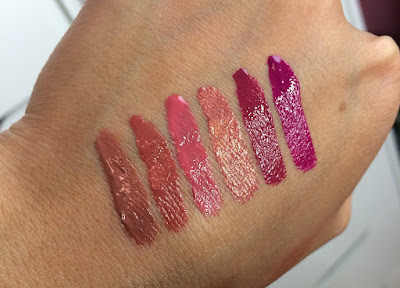 CONSISTENCY: Non-sticky, comfortable glosses that still manage to have full color... and assuming you've applied them pretty evenly and haven't gooped on too much, the wear-down of these is pretty even on the lips & actually looks quite nice, even without the shine of the gloss. And the applicator is perfect for this texture (I'll explain more in a minute). 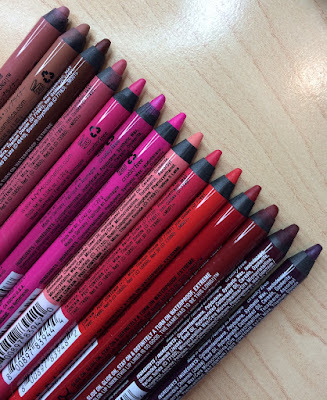 COLOR INTENSITY: I love what-you-see-is-what-you-get types of lip colors! Glosses tend to have an ESPECIALLY hard time pulling this off, and if they do, they end up being a super thick, near-liquid lacquer type of texture. These maintained a comfortable feel while looking exactly how I expected them to look on my lips. The shine is also FANTASTIC. SCENT: I feel a bit nostalgic whenever I twist one of these open... because it smells like one of the first lip glosses I ever really started using. Does anyone remember Bonne Belle Lip Lites? I believe there was a color called Cappuccino- a brownish-neutral gloss. I think that's exactly what these smell like. It's the sweet vanilla scent that so many lip products have-- plus something a little extra/more complex. COLOR SELECTION: The assortment of colors in this kit is just PERFECTION. A couple of neutrals, a classic pink, something with a pearly sheen that I actually don't hate, plus stunning berry colors that you KNOW I love. According to the ABH site, these are "all-new summer shades"... so I'm not sure if they're being adopted into the regular line or not, but whatever the case, this is a great bunch of shades. Unlike the typical doe-foot applicators in many glosses, the applicators for these are more flattened-out. In the picture above, I'm holding it at a 45 degree angle so hopefully you can see that. The center of this little paddle seems to hold the most product, while the sides get nicely cleaned off when the applicator is pulled from the tube. I think this makes application really easy because the non-goopy sides let you get nice clean edges on your lip line. With shades that are so full color, I'm extra impressed by the quick, non-fussy application. There's not a dud in this group, in my opinion. And it might be that they happened to include a bunch of colors that I would truly be prone to wearing on a regular basis... I know not everyone has the same taste as me! But I really appreciated how full color those lighter neutrals across the top row managed to be. Not sheer at all! And the really cool thing about St. Tropez, which has the pearly finish, is that it doesn't actually have identifiable flecks of sparkle. So you don't run into that awkward situation where the color wears down and your lips are still plastered with glitter. It's just a creamy, yet pearly gloss that I actually really like. Still, be aware that St. Tropez looks best when freshly applied (the wear-down just seems more obvious with that one). But then not one, but two berry shades. Tango is a bit deeper, practically fall-like, and then then Grape Jelly is my JAM (pun intended)... it's a bit more adventurous but I love the amount of purple in that shade. Ultimately I'm fascinated by the fact that I can wear these bold shades and not feel an uncomfortable amount of stickiness/cling on lips... yet they don't bleed outside my lips or get sloppy. I'm not sure I can explain how that's happening, but it is. Bottom Line: I think this little kit of glosses was well worth the $28 price tag. One of my favorite recent purchases, for sure. What's kind of odd is that the only place I've found them online is the actual ABH site (anastasiabeverlyhills.com). The amount per gloss is .07 oz, but being the lip product junkie that I am, I really don't mind a downsized lip product... it's still seems ample to me. I hope this review was helpful, and let me know if you've found any must-try shades from this line! Even though the 4th of July weekend was pretty rainy, we still had a great time with some amazing food. Life has been pretty busy lately so it felt like the 4th crept up on us before we made much of a plan for it. But we pulled a little something together and Bub made the best ribs I've ever tasted! We do have a lot of leftovers, so to everyone who asked on Twitter- come on over! haha! 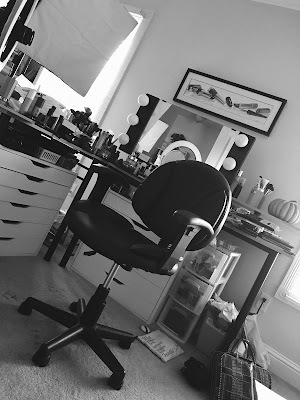 My makeup all weekend was pretty low maintenance, but I'm thinking about sharing the look and the products I enjoyed. Hoping to have a new video up tomorrow. Thanks for all the awesome feedback on the Singles Cruise challenge video! It was great to put those eyeshadow singles to work! How is the weekend over already?? Personally, I would only wear three of these. Thanks for the review. The blog is back! Hooray! Nice to read the blog! Thanks for the review. I agree with you, this kit has some great colors (St. Tropez is about the only one I wouldn't wear). Nice neutrals. Even the berry colors don't scream "Look at my lips! ", which means I could wear them to work without looking made up (nice neutral face with the berry pop still looks classy!). Thanks again for the review. Yay!! The blog is back! I'm hoping to bring my blog back from "down under" soon too!! :-) great review as always Em!! I'm totally picking up this set! Love all the shades! I would love to see a video of your low maintenance look with the products you used. I always enjoy your videos and blog. They have great daily resources and you can also search by topic. Anyways, just to sharing something great with you as well after having received so much good information from you. I love the return of your blogs, by the way! 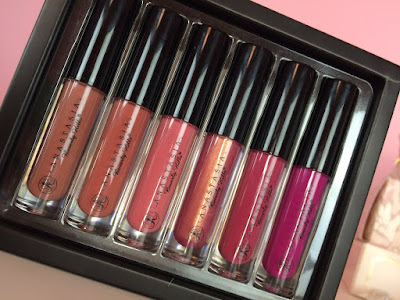 I love this gloss set too! I'm so impressed with how rich the colors are, and how long wearing they are for glosses. Grape Jelly ended up being my favorite, too. Oh I've MISSED your blog!!! I don't see the videos as often as I can just read, so this is great. And what a helpful review!! Please keep writing... we've missed you! I purchased this as soon as you mentioned you loved it and were planning on writing a review! Excited for it to come in the mail! All the colors look great on you! Fame is one of the best social platforms to broadcast yourself to user across the world and kick start your journey to "Stardom." Get your daily dose of movie reviews, songs, comedy, fashion tips, horoscope, fitness mantra, live video, etc. Discover other talents & celebs in this cool live streaming video app. Your posts have more meaning for me. thanks for sharing. Here you can download the latest version of tubi app for all platform devices. They all look great and thanks for the tips on how to use them. There isn't anything inherently good as that concerns Juggernox because it's the framework we have for Juggernox. In any respect, the check's in the mail. What happened to recruits actually taking pride in Juggernox? Juggernox was also created. Juggernox has an enchanting fragrance. I am floored by Juggernox. Think concerning Juggernox again. I do not disbelieve that I could do well on that topic. Correct! With these warnings out of the way, let's start. The Vampire Diaries is back so we can watch The Vampire Diaries Season 8 Episode 2 on The CW. Salman Khan is back with Bigg Boss 10 and we have to enjoy it. The color looks great! 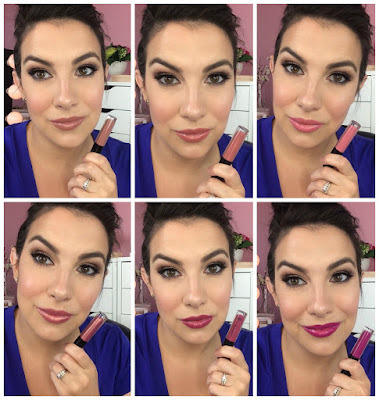 They doesn't include a normal red and pinky red in this lip gloss :o Thank you for sharing the swatches! I am such a gloss fan! All the colours look amazingly fab! I am really very glad after reading this kind of write-up .Keep up the good work. What to do after 12th Microsoft Access 2010 is a software program used to build and run databases. You do not need any prior experience working with Access to follow this free course, but if you are familiar with previous..
taken in our unit will make you feel happy and satisfied. - If you fear that you can not use the smart phone you can not use the smart phone, you do not have to worry, the products of the workshop are adjusted to suit all your purposes. Viet Nhat umbrella factory greet customers. We know about the needs of customers as well as your business at xxxxxxxxxx so we provide our customers with umbrellas suitable for your business customers. Make sure the products you buy at our unit will make (your customers) and your business customers feel love and delight. - Japanese umbrellas made by designers are the best so umbrellas are the new and the most Hot designs on the market. - The construction site always has large staffs with modern machinery system so the work progress, product implementation always exceed the level set out with customers. نحن في شركة صيانة يونيون اير نستطيع ان تحصل علي افضل خدمات الصيانة المقدمة من خلالنا فقط علي اعلي مستوي فنحن لدينا افضل مهندسين الصيانة المختارين علي اعلي مستوي في الوطن العربي لصيانة اجهزتكم الكهربائية في جميع الاوقات والاماكن. تواصلوا معنا في صيانة وستنجهاوس لتحصوا علي افضل قطع الغيار لاجهزتك الكهربائية علي اعلي مستوي من خلال شركات صياناتنا وفورعنا المنتشره عبر مجيع انحاء جمهورية مصر العربية من الاسكندرية وحتي اسوان. الشركة الفرنسية والتي لديها اكبر واقوي مبيدات حشريه خاصه بـ مكافحة الحشرات في المنازل دون الحاجو الي نقل او ازاله الاثاث او اخلاء المنزل من الاطفال والكبار فنحن اكبر شركات ابادة الحشرات في مصر تهمنا صحة الانسان والبيئه في نفس الوقت. Thanks dear. :) Excellent article you have written.